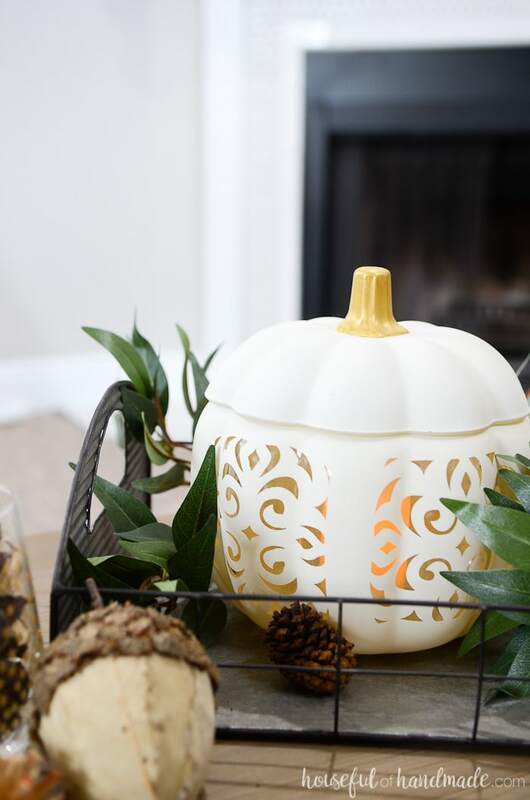 This beautiful filigree punched ceramic pumpkin knockoff is the perfect fall decor. 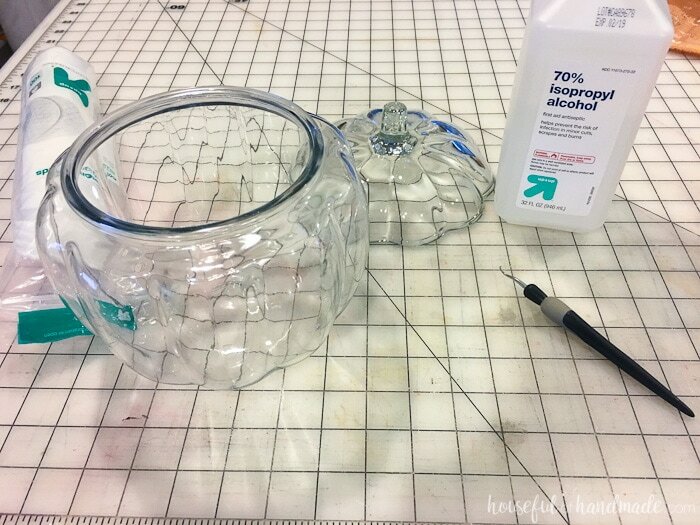 Upcycle inexpensive glass pumpkins into high end decorations. 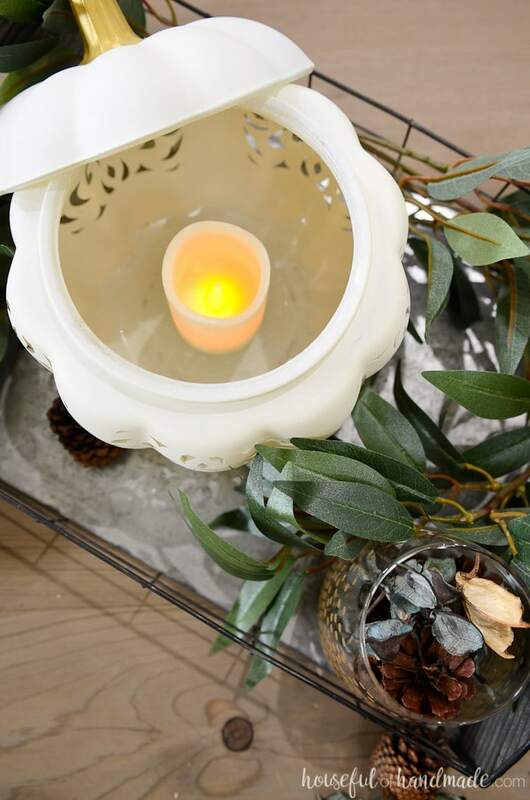 When you are decorating on a budget, upcycling inexpensive items can be a lifesaver. 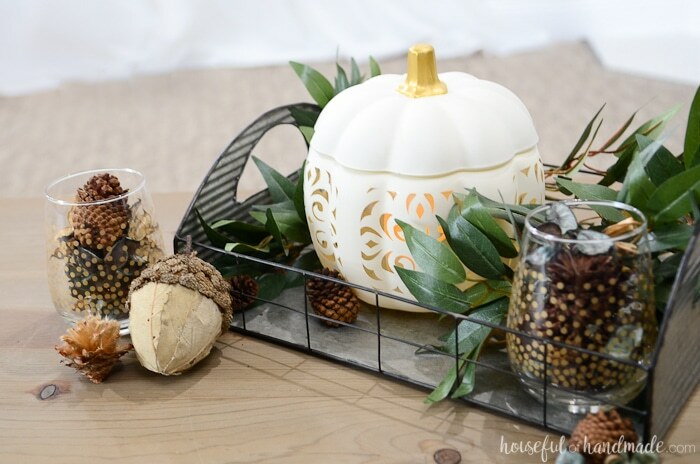 Turn a cheap glass pumpkin dish into a high end inspired filigree punched ceramic pumpkin knockoff. This easy craft is so fun, you’ll want to turn all your pumpkins into high end pumpkins this fall. 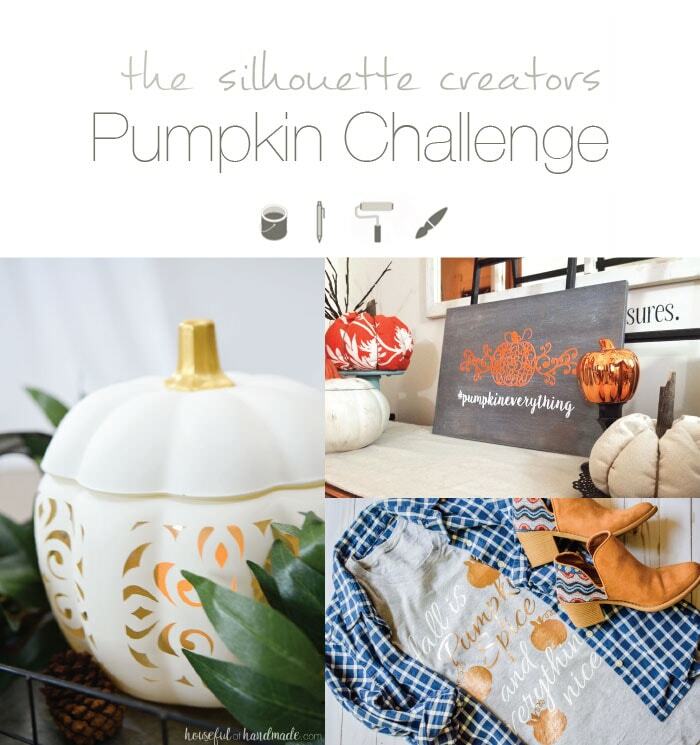 It’s time for the first Silhouette Creator’s Challenge of the fall so you know what that means? PUMPKINS! What better way to welcome in the cooler weather than with fun pumpkin themed crafts made using the Silhouette Cameo. Even before it was time for the challenge, I knew I wanted to turn this cheap glass pumpkin dish into a faux ceramic pumpkin. Then when I was ogling over the beautiful fall decor at Pottery Barn, I saw their filigree punched ceramic pumpkins and fell in love. But not with the $100+ price tag. Luckily for me, I knew I could recreate the high end look with my Silhouette Cameo. Being able to custom cut the vinyl into any design I want is my favorite thing about this amazing machine. So I set to designing a filigree design for my own pumpkin. The filigree punched ceramic pumpkin knockoff turned out better that I could have hoped! 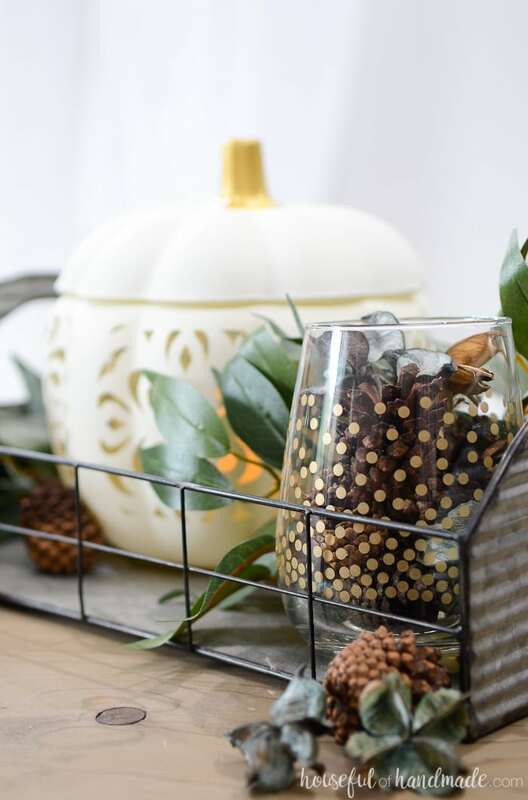 Even though the pumpkin doesn’t actually have punched holes in it, the vinyl helps create a beautiful punched effect on the glass. And now you can use your pumpkin as a candle holder, or to hold potpourri, or even your favorite fall treats. 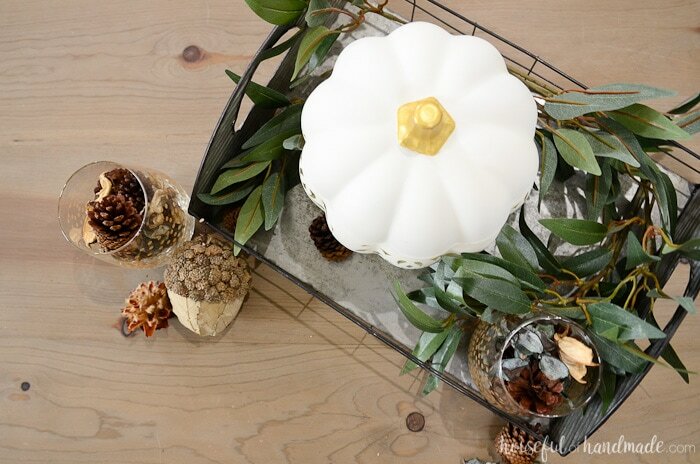 I used my new filigree punched ceramic pumpkin to create a perfect fall vignette on my coffee table. Complete with apple cinnamon spiced potpourri with neutrals and blues, it is the perfect addition to our rustic upcycled fall mantel. 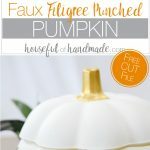 If you want to make your own filigree punched ceramic pumpkin knockoff, click on the arrow below for the complete tutorial.